Yaro Starak, founder of Entrepreneurs-Journey.com, is a highly regarded blogging authority who has sold over $1 million worth of digital products using his blog.Yaro Starak will join us for our Warrior TV: Warrior Ask Me Anything event on July 30, Thursday, 7PM EST, which will help entrepreneurs learn how to create, grow and monetize their blogs effectively. You can watch Yaro’s video introduction for the event here. Yaro Starak began blogging in 2005. What started out as a hobby transformed into an income generator for him in the years that followed. Some of Yaro’s most successful projects include a card game trading forum, an e-commerce site called Magic: The Gathering, a proofreading business called BetterEdit, and a portfolio of website investments, including the Small Business Branding blog. One of Yaro Starak’s most notable achievements on Entrepeneurs Journey is the creation of the Blog Sales Funnel, a system that combines blogging with email marketing to build a platform for selling digital training products. This taught thousands of people how to make full-time income from blogging part-time. 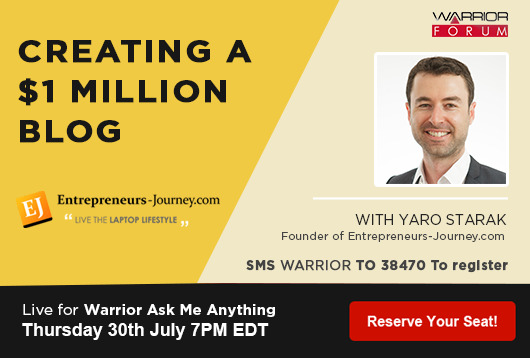 Mark your calendar and tune in to Warrior Forum on July 30, 2015 at 7PM Eastern US time to learn how to create a million dollar blog and ask Yaro questions live on Warrior Forum. If you’d like to pre-register your questions, make sure to reserve your seat here. If you are a US guest, send SMS WARRIORTV to 38470 to receive a free SMS reminder 15 minutes prior to the event so you don’t miss out! About Warrior TV: WAMA Events: Hosted by Warrior Forum,Warrior Ask Me Anything (WAMA) events are Q&A video interviews where the world’s top Internet Marketers and entrepreneurs share their strategies that have helped them become industry icons.